Class Module Allows the user to create their own objects. Method A public function or sub in the class module. Member variable A variable declared in the class module. Property types Get, Set and Let. Event - Initialize Sub that automatically runs when the class module object is created. Event - Terminate Sub that automatically runs when the class module object is deleted. Members of the VBA Vault can access the webinar for this article by clicking on the image below. 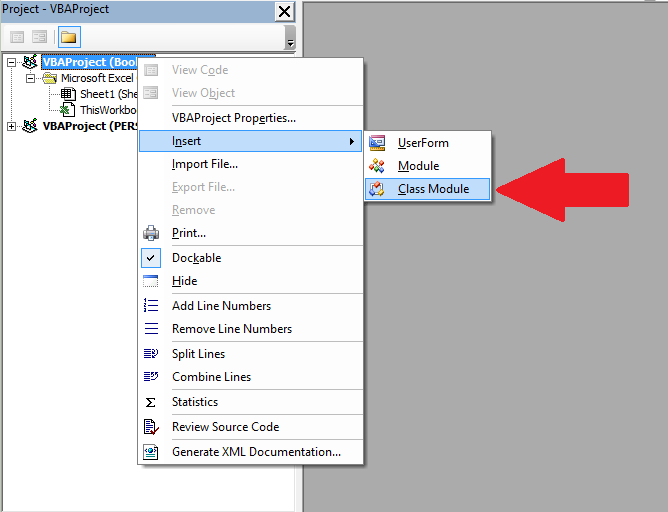 VBA Class Modules allow the user to create their own objects. If you are not familiar with objects then I would highly recommend that you first check out my previous post VBA Objects – The Ultimate Guide. In languages such as C# and Java, classes are used to create objects. Class Modules are the VBA equivalent of these classes. The major difference is that VBA Class Modules have a very limited type of Inheritance* compared to classes in the other languages. In VBA, Inheritance works in a similar way to Interfaces** in C#\Java. In VBA we have built-in objects such as the Collection, Workbook, Worksheet and so on. The purpose of VBA Class Modules is to allow us to custom build our own objects. Let’s start this post by looking at why we use objects in the first place. *Inheritance is using an existing class to build a new class. **Interfaces are a form of Inheritance that forces a class to implement specifics procedures or properties. 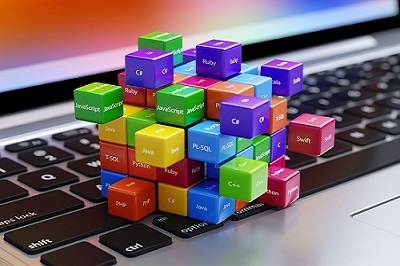 Using objects allows us to build our applications like we are using building blocks. The idea is that the code of each object is self-contained. It is completely independent of any other code in our application. This is similar to how things are built using Lego® bricks. There are many different types of Lego® components used. For example, a block, steering wheel, and laser are different items. They behave completely independently each other. The wheel spins, the laser rotates etc. Yet we can connect them together to create a building, vehicle, space station and so on. If you are still not clear about this then don’t worry. We’ll be breaking it all down into simple terms in the rest of this post. It allows us to build an application one block at a time. It is much easier to test individual parts of an application. Updating code won’t cause problems in other parts of the application. It is easy to add objects between applications. It takes more time initially to build applications*. It is not always easy to clearly define what an object is. People new to classes and objects can find them difficult to understand at first. *If you create an application using objects it will take longer to create it initially as you have to spend more time planning and designing it. However, in the long run it will save you a huge amount of time. Your code will be easier to manage, update and reuse. Let’s look at a very simple example of creating a class module and using it in our code. People who are new to using classes and VBA class modules, often get confused between what is a class and what is an object. Let’s look at a real world example. Think of a mass produced item like a coffee mug. A design of the mug is created first. Then, thousands of coffee mugs are created from this design. This is similar to how class modules and objects work. The class module can be thought of as the design. The object can be thought of as the item that is created from the design. Note: We don’t use New with items such as Workbooks and Worksheets. See When New is not required for more information. Writing code in a class module is almost the same as writing code in a normal module. We can use the same code we use in normal modules. It’s how this code is used which is very different. Let’s look at the two main differences between the class and normal module. These often cause confusion among new users. If you want to use a sub/function etc. from a class module you must create the object first. You will notice the code for both is exactly the same. When you create a variable in a normal module there is only one copy of it. For a class module, there is one copy of the variable for each object you create. For example, imagine we create a variable StudentName in both a class and normal module..
For the normal module variable there will only be one copy of this variable in our application. 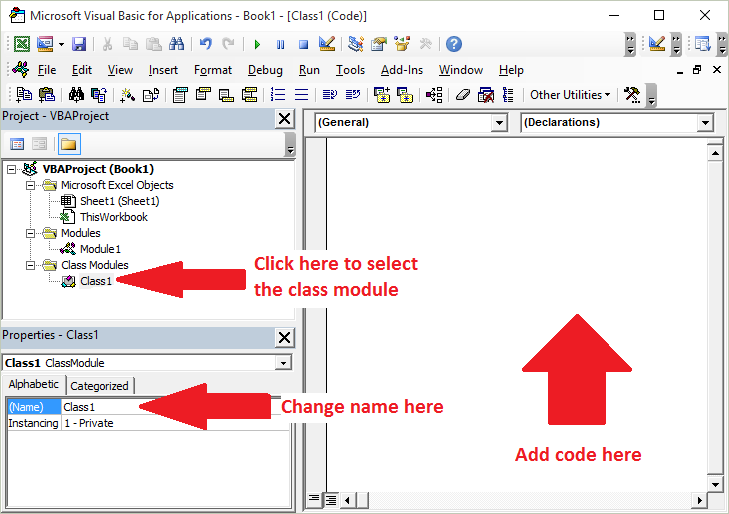 For the class module a new copy of the variable StudentName is created each time a new object is created. When you fully understand VBA class modules, these differences will seem obvious. Properties– types of functions/subs that behave like variables. Events – subs that are triggered by an event. You can see they are all either functions, subs or variables. Now that we have seen examples, let’s take a look at each of these in turn. Methods refer to the procedures of the class. In VBA procedures are subs and functions. Like member variables they can be Public or Private. The member variable is very similar to the normal variable we use in VBA. The difference is we use Public or Private instead of Dim. Note: Dim and Private do exactly the same thing but the convention is to use Dim in sub/functions and to use Private outside sub/functions. In the above example we cannot access Balance because it is declared as Private. We can only use a Private variable within the class module. We can use in a function/sub in the class module e.g. It is considered poor practice to have public member variables. This is because you are allowing code outside the object to interfere with how the class works. The purpose of the using classes is so that we hide what is happening from the caller. To avoid the user directly talking to our member variables we use Properties. We have seen already that the Property is simply a type of sub. The purpose of the Property is to allow the caller to get and set values. Why can’t we just make the variables Public and use them directly? To get the number of countries you need to know how the list is stored e.g. Array. If we change the Array to a Collection, we need to change all code that reference the array directly. This code solves the two problems we listed above. We can change our Array to a Collection and the caller code will still work e.g. The caller is oblivious to how the countries are stored. All the caller needs to know is that the Count function will return the number of countries. As we have just seen, a sub or function provides a solution to the above problems. However, using a Property can provide a more elegant solution. The second difference is that using Let and Get allows us to use the same name when referencing the Get or Let property. So we can use the property like a variable. This is the purpose of using Properties over a sub and function. If we used a function and a sub then we cannot get the behaviour of a variable. Instead we have to call two different procedures e.g. You can also see that when we used Let we can assigned the value like a variable. When we use SetTotalCost , we had to pass it as a parameter. The Property hides the details of the implementation from the caller. The Property allows us to provide the same behaviour as a variable. There are three types of Properties. We have seen Get and Let already. The one we haven’t looked at is Set. Set is similar to Let but it is used for an object(see Assigning VBA Objects for more detail about this). Originally in Visual Basic, the Let keyword was used to assign a variable. In fact, we can still use it if we like. So we use Let to assign a value to a variable and we use Set to assign an object to an object variable. Let is used to assign a value to a basic variable type. Set is used to assign an object to an object variable. We use the Get property to return the values for both items. Notice that even though we use the Get Property to return the Collection, we still need to use the Set keyword to assign it. Initialize – occurs when a new object of the class is created. Terminate – occurrs when the class object is deleted. 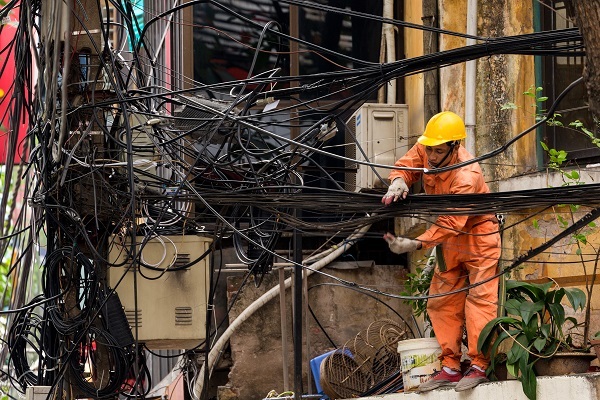 In Object Oriented languages like C++, these events are referred to as the Constructor and the Destructor. In most languages, you can pass parameters to a constructor but in VBA you cannot. We can use a Class Factory to get around this issue as we will see below. MsgBox "Class is being initialized"
MsgBox "Class is being terminated"
In the following example, we use Dim and New to create the object. In this case, oSimple is not created until we reference it for the first time e.g. When we use Set and New together the behaviour is different. In this case the object is created when Set is used e.g. We will expand on this CreateSimpleObject in Example 2 to create a Class Factory. If we don’t set the object to Nothing then VBA will automatically delete it when it goes out of scope. What this means is that if we create an object in a procedure, when that procedure ends VBA will delete any objects that were created. In this example, we are going to look at a very common use of a Class module. We want to read the Albums based on a range of years and then create various reports. We could use a 2D Array for this or a Collection of collections e.g. As you can imagine this code would get messy very quickly. Lucky for us we have VBA class modules to make our life easier. We can create a class module to store the items. You can see that this makes our code much more readable. It is clear what Artist, Title etc. are being used for. We can then easily use this data to create reports, write to files etc. In this example, we’re going to take things a bit further. We’re going to look at some neat tricks when using objects. Imagine you have a list of products like in the image below. The products have different fields so we need to use a different class module for each product type. One type for a Book row, one type for a Film row. As you can see, the only real difference is the Init sub. 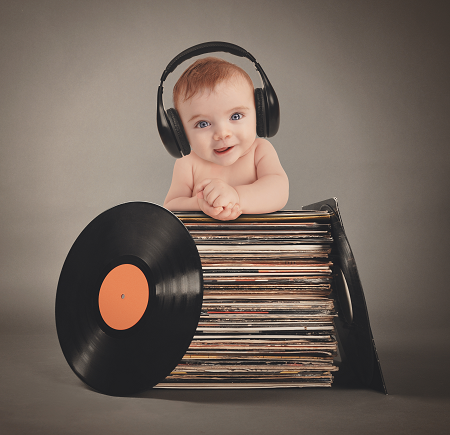 When we read each record we need to determine if it is a Book or Film. Then we create the appropriate object. You would imagine we would have to create a variable for each type e.g. If we had lots of different types this would get very messy indeed. The good news is we only need to use one variable! In VBA we can declare a variable as a Variant. When we use a Variant we are essentially saying “We will decide the type of variable when the code is running”. This is very useful when dealing with objects and allows us to get away with using one variable e.g. This is really useful as we only need one variable no matter how many objects we have. We can now create a function to create the appropriate object. In Object Oriented Programming, we have what is called a Class Factory. This is simply a function that creates an object based on a given type. We saw earlier that the Initialize event does not take parameters. We can call Init in the Class Factory to get around this issue. This following is our starting sub. In this sub, we read through the worksheet and pass the range to ClassFactory. It creates the object, passes the range to the object Parse method. Then it returns the object which we add to our Collection. We can also use the variant object to print the items. As long as both objects have a sub with the same name and parameters(e.g PrintToImmediate) we can call it using a Variant type. That concludes my post on the VBA Class Modules. In this post, we have looked at the parts of the VBA Class Module and two example cases where you would use them. It’s important to understand that Classes and Objects is a vast topic. There are countless types of objects you can create and ways you can use them. If you plan to use Class Modules then my advice is to start simple and get familiar with how to create a simple one. Once you have mastered the basics it will be much easier to move onto more challenging scenarios. Using a class, what can I replace the ??? with? If really depends on the overall design. If you use a class then the calculations take place inside. The code below is an example of how you would use a class. Instead if you used class modules, you can easily identify what arr(i, 1) would be, etc. Whatever way you use the class it will still be necessary to use this code arr(i, 1) = arr(i + 1, 1). It is simply assigning the next row value to the current row. Thanks Paul, I don’t think this is correct, no matter what it will not run. I’ve placed this into a class module named clsAccount and it will not run locally; testing the scope of variables in class modules. SetBalance can only be called from inside the Class Module because it is private. Change it to be Public and it will run fine. I have updated this in the post. Thanks for your rapid response Paul and the article. Yes I managed to run it outside the class module using Public however the tutorial insinuates it can run inside the class module itself; but this isn’t the case. I’ve put the code in exactly as the tutorial and tried running directly from the class module but it will not run, thanks again. What do you mean it doesn’t work. Can you post the code you used and the error that you got? Thanks for your response, apologies for the slander, I read it a thousand times “In the above example we cannot access Balance because it is declared as Private. We can only use a Private variable within the class module. We can use in a function/sub in the class module e.g.”. I know you are illustrating the scope of variables here as the primary lesson. “We can use in a function/sub in the class module” I took this to mean that you could run class modules independently like normal modules, but of course I was mistaken. The class is applied to an item/ object; much like html and css. Apologies again and thank you greatly for taking the time out of your day to help us simple folk learn; for free! Is it possible to create a class module where a call can have “subcalls”? Is this possible? Thank you very much in advance! Yes. You could have a class called clsPrint and you could have this as a member of the ThingsTodo class. Then you could use it like you’ve shown. Note: You cannot use Print as a variable name as it is a reserved word. Thank you Sir! I would like to say that your tutorials are the most complete on the net and very well explained. That would be great if you Sir consider to make a second part of this tutorial where you Sir could talk about more advanced class concepts, like interface and the implements statement of VBA. Because the internet lack such a great tutorial about those concepts. In the code below, is it a good way to use class modules? If not, what would be the best way to achieve the same result? Using the class module to store records is fine. However, VBA does not recognise ” .”AOC”&VAR” as a member of this class. Is there a way to iterate the matching through the 7 properties? I found the CallbyName function, thanks. 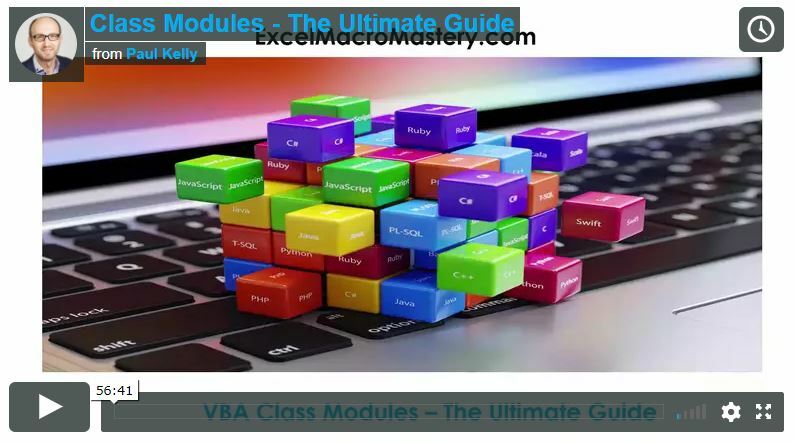 Thanks Paul for this wonderful introduction to VBA class modules. In era where every “ultimate guide” only sratches the surface and has 20 subpages this one just blowed me away. Paul, your tutorials are works of art. I’ve had decent success using the Excel object model, but one thing about custom classes is very confusing to me – the SET statement can change an object variable containing a discrete instance of the class to a reference to another instance. Wouldn’t it make more sense to be able to declare a variable as either an instance or a reference, and for VBA to enforce that usage? R2 will continue pointing to I1 regardless of any change to R1? If you look at VBA Objects in Memory it explains how the object variables work. Each object variable stores the address of the object. When you use “Set R1 = L1” you are essentially copying the address in L1 to R1. They are now both referencing the same object. R2 isn’t pointing to L2. It’s pointing to the object that was at L2 when set was used. I wanted to limit the scope of some object properties defined in a class module and have made them private. I eventually realized that in this way they would not be available for other regular modules. Do variables defined in the class module need to be public to be accessible from other modules? Yes. If variables are private they are only accessible within the class module. It is better to use properties instead of making variables public. However, if the class is a list of variables and nothing else then making them public is fine. Is it possible to define Properties “on-the-fly”? I am thinking about the **kwargs approach in Python. Because I do not necessarily know what/how many properties I will be adding to my object but I would love it if I didn’t have to add a property every time a new one is specified. You mean like Reflection that’s available in C#\Java. It’s not possible in VBA. I’m not sure whether this is what you want but I had to do this in a project and used an approach much like the way that values were stored in .INI files. I implemented the creation of the new properties as a method LetProperty (PropertyName AS String, Value AS String) and getting the value of a property as a function GetProperty(PropertyName as String) AS String. I was happy that the values were all stored and return as Strings but you can get round this if that doesn’t suit you. The Class used a dictionary to store the names and values of properties. LetProperty checked to see if a property with the specified name already existed, creating one if there wasn’t, then stored or updated the value. GetProperty just retrieves the value, raising an error if there is no property with the specified name. Paul, I am trying to use VBA classes to define shapes in an Excel-based visual process-modeling application. I want to build and manage complex group shapes that define different types of visible model shapes. The shapes will have many common properties, but some unique ones also. Same with methods of course! I am not sure how I can use a VBA Class module to define an object that is based on an Excel shape / group shape. I am currently using “template” shape objects that I programmatically copy and paste to create new shapes. I think that is a good strategy for managing and evolving visual shape designs, but maybe not for OO design? You see, I’m an experienced VBA programmer, but with…”no class”, so I don’t even know what questions to ask! Hi Dave, If you google OO Design Shapes you will see lots of examples of using shapes in Object Oriented programming. You create a base class of shape and then derive from this using the Implements keyword. Keep in mind that VBA OO is limited compared to other languages. Thanks Paul, I think that got me started in the right direction! I don’t know of a good resource on Shapes. It is one of the areas of Excel VBA that doesn’t have a lot of coverage. There is stuff here but it maybe a bit basic. What you are trying to do should be possible in Excel. I would start with a simple application and see how far you can get with it.